An all women’s college may not be at the top of your dream school list. But after considering the quality of education, the alumnae network, and the many other benefits of attending an all women’s college, and you just might change your mind. Read on to learn the costs and benefits of attending an all women’s college. The first all women’s college was founded in 1772 by an early Protestant denomination, the Moravians. What started out as a school for girls eventually transformed into Salem College. 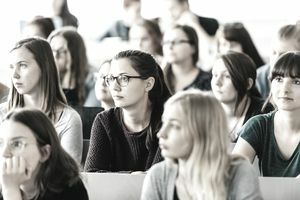 In the following decades, women's’ colleges became more prevalent, due in part to social shifts sparked by major events like the Civil War, the Industrial Revolution, and an increased focus on women’s rights. Today, the Seven Sisters – Barnard College, Bryn Mawr College, Mount Holyoke College, Smith College, and Wellesley College, along with Vassar College, (which now admits men), and Radcliffe College, (now a part of Harvard College) – are considered some of the best colleges in the U.S.
And while dating (for heterosexual women, anyway) may be a bit more difficult at all women’s colleges, the representation and inclusion of women in all fields, the quality of education, and the alumnae network are some major pluses. The Top Women’s Colleges in the U.S. While the lists vary, top all women’s colleges in the U.S. include Wellesley College, Smith College, Bryn Mawr College, Barnard College, and Mount Holyoke College. Wellesley College, located in Wellesley, Ma., boasts high-profile alumnae like Hillary Clinton and Madeleine Albright. Students also have the option to coregister at other distinguished schools like Dartmouth and MIT. Wellesley costs $46,836/year, has an acceptance rate of 29 percent, and a student body of 2,368. Located in Northampton, Ma., Smith College is the largest member of the Seven Sisters. It offers more than 100 student organizations, but no dorms of Greek life. Smith costs $46,288/ year, has an acceptance rate of 43 percent, and has a student body of 2,503. Bryn Mawr College is located just outside of Philadelphia, Pa. It’s known for its Balch Seminars, intensive reading and writing discussions for first-year students only. Notable alumnae include Katharine Hepburn and Nettie Stevens. Bryan Mawr costs $47,140/year, has an acceptance rate of 40 percent, and a student body size of 1,309. Barnard College calls New York City home and has a focus on gender issues and real-life resourcefulness. Students also have the opportunity to take part in exchange programs with Columbia University and The Juilliard School. Barnard College costs $47,631/year, has a student body of 2,466, and an acceptance rate of 23 percent. Mount Holyoke College is located in South Hadley, Ma. and was the first of the Seven Sisters. The college is diverse, offering courses on many global issues and topics. Mount Holyoke costs $43,886/year, has a student body of 2,290, and an acceptance rate of 47 percent. How Do They Compare Financially? It’s no secret that college costs are on the rise. In fact, the cost of attending a four-year, private college has risen 129 percent since 1988, and the average 2017 college graduate left school with nearly $40,000 in student loan debt. Today, the average cost of a four-year, private liberal arts college in the U.S. is around $26,000/year. So with their nearly-$50,000/year price tags, the top women’s colleges in the country are definitely more expensive than your average college education. While this can create a bit of sticker shock, there are some affordable all women’s colleges to consider. Regardless of what avenue you decide to pursue your college education, some financial planning is in order. While it’s always a plus if your parents or guardians took advantage of a college savings tool like a 529 savings plan for you, that isn’t always the case. You can help offset the rising costs of college by working during the summer to save money for next year’s tuition, living off-campus to save money, or getting an on-campus job during the school year to help pay for living expenses. During the college application process, it’s also wise to apply for scholarships and grant programs that can help take a chunk out of your tuition bill. There are many different types of scholarships available for incoming college freshman. Do your research and apply for those that seem like a good fit for you. Remember, you have nothing to lose by applying, and it could end up helping you financially in the long run. Financial aid can also help close the gap.